The one-stop shop for customers in RepairShopr. This is a dense kb article. So if you are looking for something specific we recommend using your browser's ctrl+f search command or the anchor links in the Table of Contents. The Customers section is the home for all of your customer information and the place to go to view their historical information. Navigating to the Customers tab is super easy. There will be a Customer tile along the top of RepairShopr by default. You can move it around in the Tabs Customization if you want as well. We often refer to the Customer tile as the Customer Tab in our documentation. There are several ways to go about creating a customer in RepairShopr. So let's go through them! Click the GIANT green button on the main page! Click the Customer Tab then click the green New Customer button on the right of the next screen. So you have a bunch of customers and don't want to manually enter them? I wouldn't want to manually enter them either. We have a couple solutions for you. If you are using the Quickbooks integration or the Xero integration head to option 2. You can download a template that has the CSV headers configured for the import tool (make sure not to modify those!) on step 1 of the next page. Once your CSV is ready to go, you can import from this page in step 4. BONUS STEP: To make things proceed a little faster, we recommend turning off the User-based minimum requirements for customer creation (This stuff gets covered later on but I'll mention it here also). Head to Admin > Customer Preferences > "Optionally, require these fields when creating a customer" drop down and uncheck everything > Save. 2. Import customers during the setup of Quickbooks Desktop/Online or Xero Accounting integrations. Both the Quickbooks integration and the Xero integration have setup wizards and will prompt you to import your customers during the setup process. We strongly recommend importing your customers this way if they exist on the QB or Xero side of things. 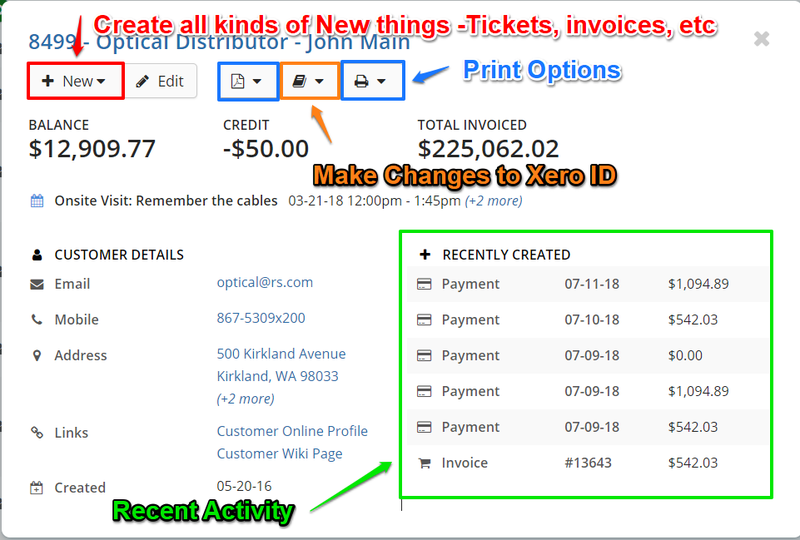 This makes it so that the customers are linked to their QB/Xero counterparts, ensuring that they will sync right away without additional steps. Both integrations can be found in the App Center. Head to Admin > App Center > Quickbooks or Xero. This is the home of your Customer database. Your customers are listed here in alphabetical order by last name and business name. The search field can be used to search by name, business name, email or phone number (there are other places in the software to quickly look up customers also, specifically the Search All the Things field that is at the top of every page). Anywhere that a Customer is shown on the Customer Tab, Tickets, Estimates and Invoices, there is a hover-over icon that can be clicked to quickly view information about a customer or make quick changes to their record. This page will show you everything about this customer that relates to your business. There are links and sections here for days...The idea here is to make everything easily accessible. The next section of this KB is to define things on this page. Clicking the Orange 'New' drop-down to access the ability to create all new manner of things. Reminder: Set a new Reminder that is associated with this customer. Email: Send an email to the customer. Attachment: Upload or pull a file into the customer record from your local device or your preferred cloud storage provider like Google Cloud. Invoice: Create a New Invoice. Estimate: Create a New Estimate. Ticket: Create a New Ticket. Payment: Create a New Payment. Customer Purchase: Create a New Customer Purchase. Store Credit: Add Store Credit to the customer record. Recurring Invoice: Create a Recurring Invoice for the customer. Kabuto Subscription: Takes you to the Recur Recurring invoice with packages and policies associated. Kabuto Installer: Download the .exe installer associated with the Customer. Clicking the Edit button allows you to make changes to the Customer Record. Keep reading for more details. You can make changes to the main contact's information for the customer record here. Click the Custom Fields Tab to make changes to any Customer Ticket Fields you may be using for extra data points on the customer. The Actions drop-down here allows you to Merge or Disable customers here. With Great Power comes Great Responsibility and all that. Be certain of what you are doing as there are no takesy-backsies. There are 2 options for printing things from each section. There is a PDF (the option on the left) and the AutoPrintr button (the button on the right). They both offer the same printing options. The Communication Log Tab displays a record of most communications that go out or come in from the customer. You are also able to record inbound/outbound communication manually to the log as well. The more info the better right? This tab is helpful to track who has made changes to the Customer Record! Next, you should now have the option to create Customer Contacts on the Customer Detail page. Should you collect more than 12 contacts on a record, a search field will appears above the contact list that lets you quickly find the Contact you are looking for! Similarly to Asset, Tickets and Customers you can create fields to track custom data points for your contacts. This is great if you are tracking employees for a company or need a place to store passwords owned by a particular family member of a customer. You will be taken to screen where you can name the field and choose the type of data that gets entered. Check Box: Creates check box lines. Drop Down: You can make field with a Yes/No answer. Date Field: Allows you to choose a date. Popup: Will create a pop-up when someone visits the Customer Detail page. After you have created all the fields you want, make sure that settings are Saved and head over to a Custom Contact. When viewing or creating a Contact, the Custom Fields will display under the Contact's Details. Create fields to record specific information about your customer that you want/need to keep on file. Things like type of customer (residential or business), or maybe specific information about the business that may need to be referenced. On the next screen, you will be presented with any existing Custom Fields and have the option to edit those or re-order them. Quick Tip: If you have been using a a particular custom field on customers, do not change the name of the field. The data already contained in the field for customers previously will not longer show. Worry not, putting the name back, will cause the data to return. Click New field or Edit to get to the Custom Field Edit screen. The Field Type drop down allows you to choose from a selection of options to record info! Turn on SMS by default: Enables SMS for each customer by default. Enable Multiple Contacts on Customers: Allows you to have one umbrella Customer, with several points of contact within it the larger Customer record. For example if you are working with a company with several locations/store owners, you can add each one to that same company's Customer Record. List for tracking Referred By: Lets you edit the referral source options when you create a new Customer Record. If you want to track referrals by existing customers, just enter "Customer" as one of the options and a drop down will appear when you are adding referral sources for new customers. Always Send Portal Invitations to new customers: This will send Customer Portal invitations to all New Customers that are created in your account. Secure with a password the portal if they have any Portal Users, even if they are invites that are unclaimed: Further secures the Customer Portal. Yay Security! Enable the Prepay Hours tracking feature: Allows you to sell and apply pre-payed or block hours to a Customer. Refer to this article to learn more. Enable a Documentation link for each customer: This enables the wiki feature for all customers. You can read more about that in this article. Disable the address autocomplete: Will disable the auto complete for addresses. Optionally, require these fields when creating a Customer: Sets requirements for certain info fields when you create a Customer. Disable Customer Portal and redirect to URL (Leave blank to allow access): Redirect customers to a URL of your choosing rather than have them go to the Customer Portal.